On another note what's going on with the midtown crossing project on Bellview? Some tweaks were made and the final plan was recently submitted. I am not sure where that puts them in the timeline/approval process. I need a side gig/corporate retirement thing. Is there an app for that? How bout the Bar that used to be The Pointe? Looked like they were cleaning the building up but havent heard anything about something moving in. It is supposed to be a restaurant/bar and coffee shop, tentatively called Eat and Drink on 44. It keeps getting delayed. I think it was originally supposed to open late last summer. Here is the most recent press I have seen, saying it would open in February. Overland Park-based restaurant and retail group 39Bevco is still wrestling with what to call the restaurant, bar and coffee shop first announced as Eat and Drink on 44. What is certain, though, is that the new multi-level restaurant concept will open in the space where The Point Bar & Grill operated for over three decades in February 2019. Culinary director Joe Shirley says the new concept will offer the West Plaza neighborhood a basement speakeasy, a casual first-floor restaurant with a scratch kitchen, a second-floor lounge and game room and a coffee shop in the annex building next door. The space also has a sizable outdoor patio that connects the two buildings. Menu items include appetizers like Buffalo chicken dip, hearty fried shrimp, tuna tartare and pork tenderloin sliders. For lunch, expect a signature burger and a corned beef sandwich along with a shaved kale salad and a few other items. Dinner entrees will include fresh pasta, grilled chicken, a pork chop with savory apple cobbler and a steak filet with fries and Béarnaise sauce. OF NOTE: The speakeasy downstairs will feature high-end craft cocktails and a quieter vibe. By contrast, the bar and lounge on the second floor will be more energetic, featuring games and plenty of drink specials as well as a full menu of cocktails, wine and beer. From the successful developers of Garment House and Jon Russell's BBQ, we present.... something that will never open. And c'mon - Eat and Drink on 44? They're just trolling us now. I dare them to use a sans serif font. I'd go to a bar called Side Gig. Yeah I dont see this opening. I live over by there and the opening date has been pushed back several times and haven't seen any activity on it in a few weeks. Paging Johnny Kaws West. If the West Plaza Flats project is intended to be a college apartment complex its not a terrible idea for Kaws. I'm pretty sure that this is the proposal that the surrounding neighborhoods gave the thumbs-down to and the owners weren't sure what direction to go after that. I can't remember where I read it, though. Glad this thread was started. West Plaza is an interesting community. Very vocal on Nextdoor and FB groups. They have some challenges unique to Midtown. Not necessarily within West Plaza, but likely of interest: I heard word of mouth that a local brewery and bar is opening in the shops near Hi-Hat on State Line. Source was involved in some manner, doing this as side gig/corporate retirement thing. next to the chocolate shop? I think its great for the neighborhood and like jasty, think most of the houses torn down were not well kept. Most of the new builds look great either for their contrast to the old bungalows or how they compliment them. There are exceptions. I would say the last round of development when crappy duplexes were built (in the 60s-80s or whenever) did more harm to West Plaza than these modern single family houses. I’m not sure what the answer is here. There are some houses that are in poor shape. There are also a lot more that could use a new roof and a better kitchen and they would be great for the next 20 years (I know this from experience). And the 60’s capes are odd fits into the neighborhood that often haven’t aged well. But I’m also not convinced that these houses will last as long as what they replaced - especially the ones with massing like the houses on Terrace or this one. And the trend toward larger houses in the neighborhood will eventually eat away at the density. There are neighborhoods in larger cities that routinely do modern infill well, but for some reason it’s a struggle in Kansas City to not plop a suburban house in the middle of the city. Someday some smart developer is going to make pots of money building new, modern homes in the city that stand a chance of lasting more than a few decades. Looks like we have some activity on the westside of Belleview between 44-45th. The right lane is blocked and there was a bulldozer out. I believe some houses are getting torn down. Houses along Westport road next to Mike's Liquor also were knocked down this week. They were formerly businesses, but had been closed. Looks like they have settled on the name Madison's Neighborhood Eatery and are now planning on an early June opening. Rumor is that Mike's Liquor is building on that lot. Employee confirmed this a few weeks ago. it's going to be a huge liquor store. Correct with the new Mikes (with drive through) and the mega QuikTrip and all the other cheap franchise joints this strip will no doubt become a walkable pedestrian paradise. LOL it was very kind of Quiktrip to build a pedestrian cross walk on the top of Holly. Did someone say "walking paradise"? 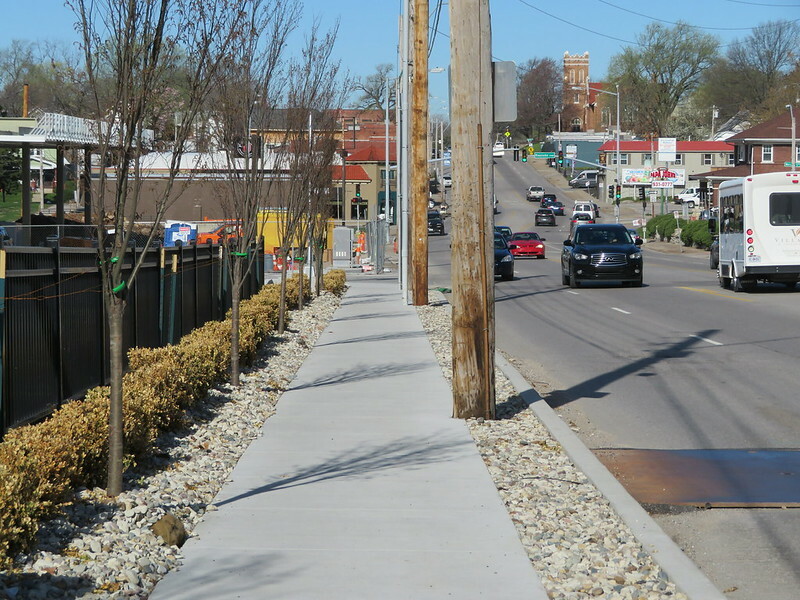 So sad.....KC needs to learn that "walkability" isn't just about building sidewalks. It's about making a comfortable, safe & interesting walk. I'm finding that it's actually faster to park and go inside than go through restaurant drive-up windows. I note the last car in the drive-up line when I pull in, and I'm leaving with my order while they are still in line. Depends on the time of the day though. Last edited by FangKC on Thu Apr 18, 2019 11:54 pm, edited 1 time in total. LOL your giving yourself away. Who you work for? Apparently your one of the new "players" who intend to remain onstage when all the now shell shocked and wobbly-kneed neighborhood Mitigationists depart this earth in tears for a mysterious realm that turns out not to be a pre 2010 era "charming" West Plaza with a happy gardener in every front yard. Anyway at this point conflict isn't going to help anything or anybody at this point. Things have become tense and stressful enough in the West Plaza as it is. Have a good day. This dude manages to disparage gardening and 'happy gardening' at that. This attitude is the eyesore. Who wants real estate raiders as neighbors?